ONE PIECE Bounty Rush is the latest ONE PIECE game title from Bandai Namco Entertainment. The game features a variety of ⇒game modes; solo, friendly/private matches, and the league matches. Among all these modes, league mode is the main one. In the league battles, 8 players from all over the world play for their team. You will randomly join a team of a total of 4 players and fight against another team for the treasure. Getting the victories in the league battle will promote you to the next league where you will fight against the pro players. If you have just started playing it, let’s have a look at our ONE PIECE Bounty Rush guide and ONE PIECE Bounty Rush tips, cheats & strategies! ⇒You can select up to two characters for the battle. Before the battle begins, you can select one of these characters. You will be able to use the second character when the enemy knocks off you(In the second spawn). In addition to these two party characters, you can add support characters to increase the stats of party members. ⇒To win the battle, your team must capture the treasures(more than the enemy team) in due time. You can win the match before the due time if your team dominates on all the treasure points for a few seconds. ⇒Tap the enemy to target it and then use basic attack or skills. ⇒You will often see the power-ups on the battlefield; power snacks, recovery meat, and speed juice. Grab them to get a temporary boost. Power Snacks – Increases your power. Speed Juice – Increases speed. Recovery Meat – Recovers HP. ⇒Always keep in mind that it is not a fighting game. It does not matter how many enemies you killed. Only the treasure matters! So always focus on capturing treasures rather than taking fights. It only consumes time. ⇒After the battle, you will get rewards(depends on the number of treasures captured by your team), league points. These points will rank up you to the high leagues. You start from D- league. As you rank up, the rewards you get from league battles will increase. So the rewards get better as you progress to high-rank leagues. You can unlock new characters by collecting fragments or directly summon using the summoning ticket or rainbow diamonds. Go to the scout menu screen -> there you can spend rainbow diamonds to scout/summon 11 characters. If you get the duplicate character, the game will convert it into the fragments. Character fragments are used in increasing the grade. As the grade increases, you will be able to develop the character further(level cap, new trait, improvement in stats). Ticket Scout – It the premium summon feature. You need a special summoning ticket to summon characters. You will have to spend real money for this ticket. Fragments – There are a number of ways to get character fragments; league battle reward, season reward, exchange battle points, exchange cola. The game grants Cola when you get a character that you have already upgraded to the maximum grade. Level Up -> You need EXP Orbs to increase the character level. EXP Orbs can be collected by getting victories in the league battles. Go to the party menu -> tap on a character -> level up. Grade up to raise the level cap. Equip Medals – You can craft medals using medal material. Medal materials can be obtained from the battles. You can also get the medal materials by exchanging items in the exchange menu. Win battles -> get medal material -> craft medals -> equip medals. Go to the party menu -> head to the medals tab -> craft medals -> claim medal. Crafting the medals cost you bounty coins. To equip the medal, go to the party menu -> tap on a character -> equip medal -> drag the medal to the empty slot. Upgrade Skills – You can level up character skills using the skill orbs. Skill orbs can be obtained from the solo battles, league battles, from the exchange menu. Go to the party menu -> tap on a character -> go to the skills tab -> level up the skill. Upgrade Medals – To upgrade the medals, you need bounty coins. Upgrading takes time, so keep patience. Go to the medals menu -> upgrade medal -> select the medal to upgrade -> upgrade -> confirm. Upgrading the medal unlocks a new trait slot and you get a random trait. On the same upgrade screen, you can check the trait information. Add Support Characters – In the party menu, you can deploy characters in the support slots to increase the stats of battle characters. To unlock more slots, increase the player rank. You need EXP to raise the player rank. Earn EXP from the battles. Grade Up – To grade up, you need character fragments. In the battle, you have to play according to the selected character class to contribute at best. Attacker – > Knockout enemies or stop them before they capture the treasure. This class characters are best suited for the combat. Defender -> Defender class characters have skills with the knockback effects, high DEF stats. They are good at defending treasures. Runner -> Characters of this class have good speed stats. They are good at capturing the treasures. if you are a runner, try to capture as many treasures as you can. Red element deals bonus damage to the green element character – receives less damage from the green element character. Blue element deals bonus damage to the red element character – receives less damage from the red element character. Green element deals bonus damage to the blue element character – receives less damage from the blue element character. So this would be all for now as ONE PIECE Bounty Rush guide. 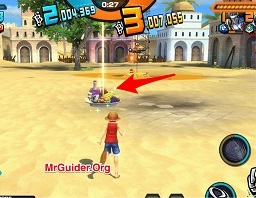 Let’s have a look at the quick ONE PIECE Bounty Rush tips, cheats & strategies! 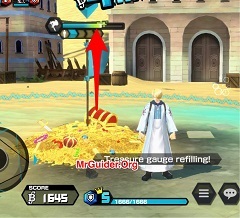 ⇒The mini-map on the right side lets you track the enemies and you can find the captured treasures. Move away if you are alone and a couple of enemies approaching that treasure spot. If there is a spot where there is not an enemy, capture it asap. ⇒If you are playing as a runner, avoid enemy encounters. Focus only on capturing the treasure spots. If you are playing as a defender, keep an eye on the captured treasures and defend them. And, if you are playing as an attacker, fight against the enemies capturing the treasures. Don’t mess with multiple enemies at a time(if you are alone). Dodging is also important. ⇒Fill the treasure gauge fully so that enemy will need to spend more time to capture it. To fill the gauge, stay in the treasure circle. You can recover the character’s health by collecting recover meat power-up. There are two more; power-snacks, speed juice. Keep an eye on these power-ups and grab them before the enemy. So these are the top ONE PIECE Bounty Rush tips for the beginners. If you have more tips to share with other fellow players, make sure to comment below.